My creative work only gets fully moving when I have settled on a metaphor, a shtick, if you will. 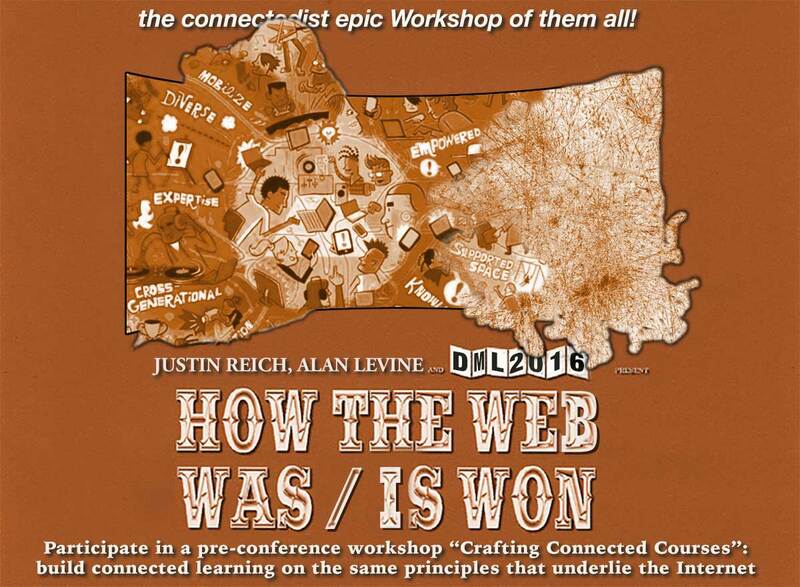 For the workshop this year with Kim we fixed on the theme of staking a claim on big open of the web. Before updating the web site, I scoured for maybe a different western to use, and landed on one I was unfamiliar with, The Big Country (1958) – loaded with name actors like Gregory Peck, Charlton Heston (not as the hero), Burl Ives (not as the cheery Santa), and Chuck Connors (as a bad guy with no honor). All of which I made use of without seeing any of the movie. I scrounged around looking for a full version on YouTube, but all you come across are stub teasers to go to some third party shady site because YouTube has taken down the uploads. I could not find it in Netflix or Amazon Prime, so I resorted to shelling out $7 for a DVD disc. You don’t get much in the box besides the disc, no pamphlet, inserts, not real disc extras. In the future I might just rent. Under the spell of my bout of bronchitis I watched all 2:45 of the movie last night. I’m definitely into it for the familiar scenery; IMDb lists a lot of Arizona locations, many in the rough country south of Tucson. WIkipedia lists only Red Rock Canyon State Park as the film location for the movie’s Blanco Canyon. Either way, I can say for sure, it’s Big Country land. The IMDb reviews are rather glowing “Magnificent”, “Easily one of the most underrated movies of all-time” “Big entertainment, bigger music”. WILLIAM WYLER’S “The Big Country,” which opened at the Astor last night, is a two-hour-and-forty-six-minute Western designed to demonstrate that men should live in peace. But before this indisputable bit of wisdom is conveyed to most of the parties involved, the screen has been crowded with quarreling and fighting and three of said parties have been killed. But for all this film’s mighty pretensions, it does not get far beneath the skin of its conventional Western situation and its stock Western characters. It skims across standard complications and ends on a platitude. Peace is a pious precept but fightin’ is more excitin’. That’s what it proves. I cannot add anything significant in terms of a film review. It’s a Western, there are good guys, bad guys, horses, mountains, cattle to chase, gun fights and fist fights. That’s all there. I’d say the most interesting part of the movie is Jim McKay, the lead character played by Gregory Peck, who is not someone you think of as a lead in a western. He arrives to the Wild West, wearing the wrong fancy clothes and hat. He reeks of being a city Easterner, and outlander, someone who does not belong. And through the taunting of the rowdy bunch from the Hannassey’s, his refusal to ride the wild horse offered by Heston’s surly ranch hand character, his refusal to fight when challenged, has everyone there underestimating home, labeling him coward. Even his fiance. We have him pegged to get a dusting. But he’s self confident, has survived worse scenarios at sea (the disdain of the man at the party, when he asks McKay if he has seen a place as big, and McKay says, “yes the ocean”). He plays by his own rules, and does not have to demonstrate his manhood in front of others. He rides the wild “Old Thunder” with Ramon, the ranch hand. He goes off on his own, confident in his ability to navigate, while everyone who knows the land so well is sure he has died. But when it comes down to it, he takes on Heston’s character in a fist fight with no audience, and earns his respect (not the most theatrical fight scene). Every other character plays according to trope, as to what Western characters do. Well, maybe. The one ranch hand questions the dirty work they are asked to do. As does Heston’s character towards the end, at least for a moment, taking a stand against the Major’s desire for violence. Maybe it’s less a story of peace being better than fighting, as the New York Times suggested, and more of the idea of strength and confidence coming from within, from character, not from what we do as performance in front of others. Anyhow, I finally got around to seeing the full movie. It was on my list to do. It still worked great as the metaphor for the workshop. At least I know so. 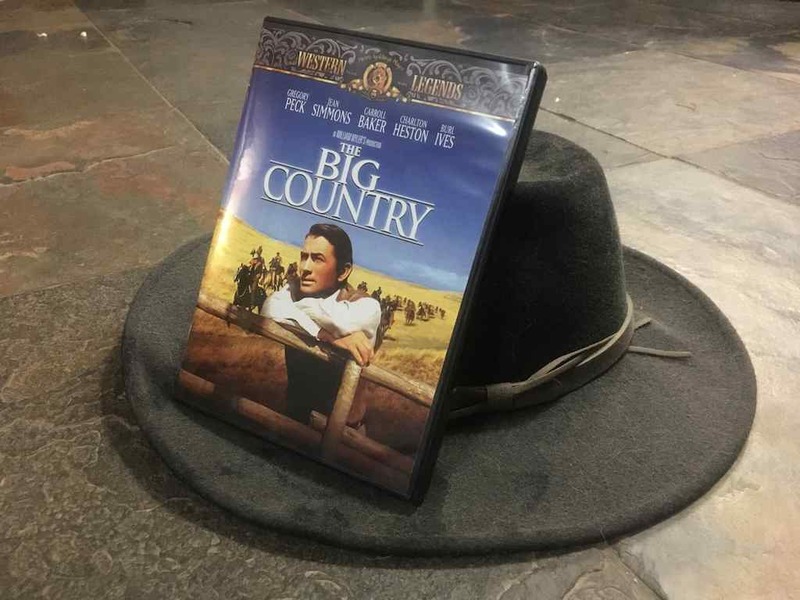 Featured Image: My own photo of the DVD I purchased, sitting atop my dusty hat, on my dirty floor. Eventually when I upload it to flickr. it will be licensed CC0, public domain. But please, steal this photo and make lots of money from it.